U2 won a pair of 2018 Billboard Music Awards at the music industry magazine’s annual event at the MGM Grand Garden Arena in Las Vegas, NV on May 20. The band earned victories in the “Top Rock Tour” and “Top Touring Artist” categories based on the success of last year’s 30th anniversary trek for “The Joshua Tree”, which grossed $316 million with sales of 2.71 million tickets. U2’s fifth album, “The Joshua Tree” spawned three hit singles (“With Or Without You”, “I Still Haven’t Found What I’m Looking For” and “Where The Streets Have No Name”) on its way to selling more than 25 million copies worldwide, including 10 million in the U.S. alone. The Irish rockers went two-for-four on the night in Las Vegas, losing “Top Duo/Group” to Imagine Dragons, whose 2017 release, “Evolve”, was named “Top Rock Album” over U2’s latest record, “Songs Of Experience”, and projects by Linkin Park, Panic! At The Disco and Portugal. The Man. Hosted by Kelly Clarkson, the 2018 Billboard Music Awards cover the reporting period of April 8, 2017 through March 31, 2018; nominees are based on key fan interactions with music, including album and digital song sales, streaming, radio airplay, touring and social engagement. 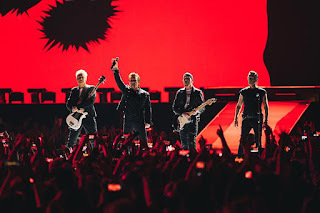 U2 launched their Experience + Innocence Tour at the BOK Center in Tulsa, OK on May 2. The group recently announced that the trek will include a June 11 appearance at the legendary Apollo Theater in New York City; the invitation-only concert exclusively for SiriusXM subscribers will mark the band' s most intimate show in the city since a 2000 gig at Irving Plaza.